What a great dental office! Awesome! Best dental experience ever!!! The best dentist and staff! So caring and professional. I was always scared to go to the dentist but when I come to Sedatis, he makes me feel with no fear. Dr. Sadati and his staff are excellent. Always the very best service and always very professional. Highly, highly recommended. Love the people and Dr Sadati . Very professional group and the paraffin is amazing!! I really do not like dentists in general, but this office is so great that I’m not nearly as anxious when I come here. Excellent service, thank you very much! I will be a returning customer. For over a decade I avoid the dentist. I have been coming to see Dr. Sadati, his beautiful office, and incredible staff for 9 years. I get stopped by strangers that tell me what beautiful teeth I have! I got over my intense fear once I started treatment in this office. I had four wisdom teeth extracted. Dr. Sadati was quick and painless. I had put it off for about 15 years. When he was done I actually hugged him! Now I keep my smile looking great without anxiety will normal, routine cleanings I can’t imagine my life without Dr.Sadati and his amazing staff. Dr Sadati did a great job. My teeth look beautiful and natural. The best doctor he is the number one! I had the mouth from *&#$! I am currently 56, and I’ve had several dentists over the years either refuse to work on my teeth or tell me after a few visits that I need to find a “specialist” as my bite was just too complicated. My complications started as a child because the curvature of my mouth was not wide enough to accommodate a mouth full of teeth. However, instead of the dentist fitting me with a pallet expander, he instead pulled 7 of my molars “to make room”. And when my wisdom teeth came in – they too were pulled. This resulted in my back teeth not fitting together (my right side was so bad I could put a finger between my upper and lower teeth when my mouth was closed). I was told at age 32 that if I didn’t fix my bite, I’d have no natural teeth by the time I was 65. However, I had very little money then and my estimated quote was 33K. So I took the gamble…and lost. By the time I showed up at Dr. Sadati’s office, I believe I had 21/22 natural teeth left and six or seven implants (I’ve lost count). Chewing was very difficult and I referred to my smile as “the rainbow smile” because due to the implants and crowns mixed with natural teeth my smile was made up of many colors. I truly believed my mouth was a hopeless cause….until I met the miracle mouth man! I remember the exact minute Dr. Sadati asked me to “bite down”, and I felt my upper teeth hit my lower teeth in back; I started to cry. He was taken aback and quickly said “But you haven’t SEEN your smile yet”; he had no clue why I was crying. I had to explain that I had NEVER felt my teeth touch in the back before; it was very emotional for me. And my smile is beyond what I could have ever hoped for! My mother was very weary and critical of the process as she knows of a few people who’ve had this done by other dentists for cosmetic reasons and their smiles scream “fake” or in her words “looks like a horse’s mouth”. However she knew I didn’t have a choice due to my bite and teeth loss issues, and when she first saw me she was blown away at how natural my smile looks. And I’m blown away at how easily I can chew!! I am now constantly told by complete strangers that I have such a beautiful smile. And I’m continually telling others that I have the best dentist there is! I could go on and on with more details, but I give Dr. Sadati my permission to give my name and number to anyone who wishes to ask more detailed questions, etc. Pretty much you name it I’ve been through it with my mouth. Dr. Sadati uses the latest techniques (i.e. has YOUR dentist ever taken your own blood and used it to heal your mouth after a procedure?) and even more than that – he truly cares for his patients and the patient knows it. I will not allow another dentist to come near my mouth; I plan on going to his office for all my dental needs – even my cleanings. Believe me, if he helped me – he can help anyone! I can not believe an office like this exsist! Such a great atmosphere, I was offered aroma therapy and watched Netflix during my procedure. Amazing visit. Always very pleasant and never rushed. Love Dr.Sadati and Riula!!! Best experience I have ever had at a dental office. The staff is amazing and Dr.Sadati is an absolute artist! As always great service the atmosphere here is addictive can’t wait for my next visit continue to set the bar in dental professionalism. Comfortable atmosphere. Friendly staff. Dr. Sadati is wonderful! This office is caring and extremely professional in every thing they do. I feel blessed to be one of your patients!! The entire staff at Dr. Sadati’s office is very professional and talented. I am grateful to him and his team for giving me a beautiful smile. Totally pain free and awesome staff! I highly recommend giving Dr. Sadati a try!!! Wonderful hospitality and great people. They made a usually stressful situation much more comfortable. Thank you. Great experience! Wonderful attentive staff! Beautiful office with calming atmosphere. Hands down the best in the business! Most compassionate, caring, wonderful competent dentistry team ever !!!! I’m a patient for life !!! Very happy and always satisfied. Dr.Sadati is very kind and gentle. Most importantly, he is very good at his job. Dr Sadati is able to perform procedures without causing the patient pain. I highly recommend him and his practice and I trust him completely as my doctor. Always a great experience .. Very comfortable atmosphere and very gentle and thorough care. What a great caring doctor. Painless experience. Excellent beautiful work. Environment is very soothing. Staff is great!! Thank you for everything! I love my new smile! I have never felt more comfortable at a dental office. I was so relaxed. The staff and the Doctor are all wonderful! I love going to the dentist! Everyone is so friendly and a pleasure. Great service! Riula was wonderful! She was very thorough (and I’m picky about my hygienist). She made me feel very comfortable, and she is super nice! Dr. Sadati is our Dentist for over 11 Years now. Great service like always. The staff is very friendly and professional. Dr. Sadati is not only a Dentist, he is an Artist. A definite 5 star practice! Dr Sam and the whole group are the Best! We still drive an hour to go to his office for the best care. Dr. Sadati and his staff (especially Riula) are consummate professionals, and are the kindest I have had the pleasure to see. I no longer live in Florida, but made sure to book an appointment for a time I knew I would be visiting. Dr Sadati and his staff are always so friendly and accommodating! I give them 5 stars and thank you so much for the great service!!! Excellent office, very professional staff and friendly place to bring all your loved ones for your dental needs. Riula is the best dental hygienist in Wellington. The office is always so warm and inviting. I always leave with a bright smile. Highly recommend this dental office. Dr. Sadati is a very warm and knowledgable dentist with a gentle hand. I feel this office is very good and safe! Thank you Dr Sadati for constantly making me feel like a family member when I’m at your office. You and your staff take very good care of me and my family. I am so thankful to have found such great people and you have the best dentistry in Florida!! Dr Sadati and his staff are the best! True professionals, and a beautiful office! I highly recommend! Lindy, my hygenist, was exceptionally sweet and tender. I appreciate her compassion and skill. Dr. Sadati is extremely knowledgable and thorough. I enjoyed his gentle nature and time. I’m a long time patient of Dr. Sadati and I’ve never had a less than stellar experience, regardless of procedure. Love my teeth. One thing I don’t worry about as I age. My teeth are timeless!!! I absolutely love this practice! The environment is very relaxing and staff is warm and friendly; I’m treated like family whenever I’m here. With Dr. Sadati, I know I’m getting the very best dental treatment. Would hands down recommend to anyone. Dr.Sadati’s entire staff is beyond reproach. Now I look forward to my semi-annual visits with Riula. I certainly hope that she will continue to be your dental hygienist for many, many years from now. She is a exceptional part of your office. She is a god send. Cleaning was fantastic thank you! The service was excellent, and I recieved great care and hospitality!! Dr. Sadati and staff are like family. I always look forward to my visits and seeing everyone. This it truly the best experience I’ve ever had. Great service, great staff. Highly recommending ! The staff are very professional and caring! Love the way my mouth and teeth feel when I leave the Sadati center! YOU ARE SIMPLY THE BEST!!!!!!! Dr. Sadati and his office are the best. I’ve been without them for 10 years and could not imagine going anywhere else! Riula is wonderful and very thorough dental hygenist. So glad she here for me. Thank you very much. Dr. Sadati completely changed my life with a smile makeover! He combines all the modern technology and tools in a state of the art office, with an artists eye to create the perfect smile. His office is like walking into an oasis complete with a one of a kind staff that completely puts you at ease. The result for me exceeded any and all expectations I had. I spent 20 plus years afraid to smile, and the mere sight of a camera pointed in my direction would cause an anxiety attack. Now I am that annoying dude taking selfies everywhere. 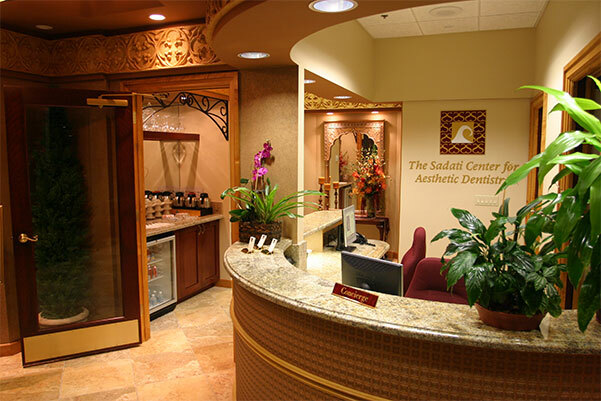 Simply put the best decision I made was to schedule an appointment at the Sadati Center for Aesthetic Dentistry! Thank you Dr. Sadati!!! Please accept my sincere thanks and deep appreciation for your invaluable and superb level of service and treatment. I am also very grateful of your assistant that went to great lengths to ensure my comfort, extraordinary! I do admire and love your professional manner and skill. Meantime, Happy Holiday! Wishing you and your loved ones a joy filled Thanksgiving. I did my homework before selecting a cosmetic dentist. I’ve seen too many people with fake looking teeth or too white teeth. I wanted my new teeth to have a natural look that brightened and improved my smile. I wanted them to look real. I began my research and discovered that top-notch cosmetic dentists are accredited by the American Academy of Cosmetic Dentistry (AACD). There are many cosmetic dentists but only a select few are AACD accredited; Dr. Sadati is one of them. Although his Wellington FL office is a 6-hour roundtrip ride from my home in Naples FL, I decided to make an appointment for a free-smile consultation. After meeting Dr. Sadati and his team—the rest is history. Dr. Sadati is a true artist in his field. You can see that he is a perfectionist, not just in dentistry, but in the design of his office, his well trained staff and how he and his team go out of their way to provide the ‘best’ guest experience. You feel like you’ve left a spa, not a dentist’s office, after each visit. I am so pleased that I found such a talented dentist and each day I marvel at my new beautiful smile. It’s almost a year since Dr. Sadati gave me my new smile and I couldn’t be more pleased and I’m amazed at how many strangers compliment me on my teeth. Dr. Sadati is not only the most highly skilled professional in the field he is also the most caring, kind, and patient-comfort focused. He also has a staff that is equally as wonderful. Dr. Sadati recently saved an existing onlay for me that no other dentist was willing to touch without replacing it. He is without question above and beyond anyone in his field. I am so thankful that my family and I are patients at the Sadati Center for Aesthetic Dentistry! I’ve been researching cosmetic dentistry for quite some time. After careful review of Dr. Sadati’s qualifications, previous work and positive peer review I decided that of all the professionals in South Florida he was the one to go to for 10 full porcelain crowns. I was married a few weeks ago and had my temporary crowns for the wedding. Dr. Sadati took the time to make the temporaries look great for the photos. The doctor really went the extra mile for me. He did an amazing job and I’m grateful for the time spent and the attention to detail. Now I have my permanent crowns and I’m floored by how great they look. It’s no exaggeration to say it’s life changing to have a great smile. My entire experience with Dr. Sadati has been top notch in every regard. By far the nicest Dentist office I’ve been to. You can tell that Dr. Sadati takes aesthetics very seriously. My thanks to the Doctor and his staff for a job very well done. Dr. Sadati and his staff are without a doubt the most professional team i have ever encountered in the dentistry field. If you think doctors don’t care, well, you haven’t met Dr. Sadati and his awesome team, a team that really cared and looked out for me. cannot thank this team enough. they made my smile the best ever. wouldn’t even dream about recommending anyone else. Broke a tooth and I needed an implant. I was nervous as it was the first time for me with this procedure. Dr Sadati did the work, drilling and the implant while I listened to music. Could not believe when it was over as I felt nothing. First time a dental procedure was a pleasure. Highly recommend. Dr. Sadati is one of the best dentists I have ever seen. I first went to Dr. Sadati in 2011 after I moved to Florida and began having complications with my teeth. When I met Dr. Sadati, I felt safe and reassured and soon knew I had found a master dentist. Dr. Sadati is brilliant in his field and able to diagnose problems quickly. He utilizes state-of-the-art technology, uses exceptional pain control and performs impeccable work. Dr. Sadati is a polite, considerate and even-tempered dentist with a staff who emulate his work ethic and professionalism. As a result of Dr. Sadati, I have no more pain, no more fear, a beautiful, natural smile and more self-confidence. Thank you, Dr. Sadati! Dr. Sadati changed my life! After a lifetime of struggles, and going to various doctors for various procedures, I finally was fortunate enough to find Dr. Sadati! I have a beautiful smile and greater confidence thanks to him and his outstanding staff! Dr. Sadati did an amazing job with my smile! We have never felt so comfortable at a dental office before. Thank you Dr. Sadati and your dedicated and caring staff. Experience for yourself how good it feels to have a brilliant, healthy smile! Feeling good about your smile, and each moment you spend with us, is our determination at Dr. Sadati's South Florida dental office. We consider each person we meet as much more than just a patient. Guests of The Sadati Center for Aesthetic Dentistry are treated as such! As our guest, you will receive special attention, a menu of comfortable amenities, and the friendly treatment you deserve. If you've never felt the personal care and warmth of a dentist who wants the best for you, we invite you to get to know Dr. Sadati. Dr. Sadati understands that receiving high quality cosmetic techniques, today's beautiful materials and long-lasting health are important to you. However, just as important to Dr. Sadati is that you feel comfortable and enjoy an open and honest environment, where your needs come first. Countless hours of hands-on coursework and more than fifteen years of experience allow Dr. Sadati to enhance your smile with artistry, conservation, and craftsmanship. Schedule a consultation to learn more about your options today.